Many people are deep into their favorite sports and recreational activities. A common result of recreational sports is repetitive strain or injury due to overuse. Two of the most popular injuries that occur are tennis elbow and golfer’s elbow. Even if you don’t play tennis or golf, these injuries can easily happen to you over time. Tennis elbow and golfer’s elbow are different types of injuries that both involve forearm muscles. But impact where the muscles connect to the joint on opposite sides of the elbow. 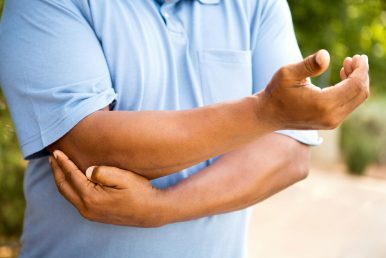 They both relate to inflammation and damage in the elbow and involve the wearing down of different tendons and the slowing of their ability to repair themselves. Tennis elbow involves the muscles and tendons of your forearm that extend to your wrist and fingers. Symptoms may develop gradually, with mild pain that slowly worsens over time. Tennis elbow usually doesn’t come from an injury, but rather from overuse of the tendons in your forearm. Symptoms include weak grip strength and a pain or burning sensation on the outer part of the elbow. Usually, they get worse when you use your forearm in activities like holding a racquet (hence “tennis” elbow), turning a wrench, or shaking hands. Golfer’s Elbow also involves the forearm muscles. In this case, we’re talking about the muscles that attach from the wrist and go to the “funny bone” area of the elbow near the inner bump. These muscles are responsible for wrist flexion (or the twisting motion of the wrist), which explains its connection to golf. Symptoms include pain or tenderness near the funny bone, or inner bump of the elbow, as well as reduced strength in your grip. This type of injury can happen outside of sports activities. Workers that regularly complete tasks that involve repetitive wrist flexion or “twisting” or forearm pronation (turning the palm downwards) commonly suffer from golfer’s elbow. Wrist Stretch (tennis elbow): Hold your arm out in front of you, palm facing down, and pull your hand and fingers back towards you using your other hand. Do so gently so as not to cause pain. This shouldn’t be painful, so if it hurts, pull more gently for a slight stretch. This should stretch your forearm. Hold for 30 seconds, relax, and repeat three times. Wrist Stretch (golfer’s elbow): This exercise is similar to the one for tennis elbow, but the hand is inverted to the other direction. Hold your arm out in front of you, palm facing up, and gently pull your hand and fingers back towards your body using your other hand. Hold for 30 seconds, then relax. Repeat three times. You can do these stretches throughout your day. Wrist Extension (tennis elbow): One of the common range of motion exercises for tennis elbow is wrist extension. Begin with your elbow at a 90-degree angle, palm facing down, resting on a table’s surface. Gently extend your wrist to lift it off the table (this should not be painful). Repeat ten times. As you progress you can add weight, like holding a water bottle, to add resistance and incorporate strengthening into the exercise. Wrist Flexion (golfer’s elbow): This exercise is similar to the wrist exercise above, but the palm is in the other direction. For the wrist flexion exercise, begin with your elbow at a 90-degree angle, palm facing up, resting on a table’s surface. Gently extend your wrist to lift it off the table towards the ceiling (this should not be painful). Repeat ten times. You can also add weight resistance to add strength training to the exercise. Grip Strengthening: For this exercise, all you need is a squishy ball or “stress ball.” Hold the ball in your hand and gently squeeze. Hold for five seconds, relax, and repeat ten times. This exercise is helpful for both tennis elbow and golfer’s elbow. Strength Exercise: One of the common strengthening exercises you can do is informally called the “hammer exercise.” You will need a hammer as your weight resistance. Hold the handle of the hammer, and keep your elbow at 90 degrees, rested flat on a table’s surface. Slowly rotate the hammer towards the centre of your body, turning the direction of your palm downwards. Then slowly reverse the motion, rotating the hammer outwards—your palm begins facing up with the heavy side of the hammer pulling on your arm. Rest briefly. Repeat ten times. You can manage your pain by modifying the activities causing the pain, such as reducing the repetition or the duration of the problematic activities. Also, seek chiropractic care, which would include the stretches and exercises listed above. You might be able to obtain compression or stability braces for your elbow. You could explore other treatments such as laser or shockwave therapy. For questions, concerns, or consultations about what sort of treatment is right for you, you can contact our chiropractor.